The gay-hating, Taliban-supporting, Super Mario-moustached cat is well and truly out of the bag. 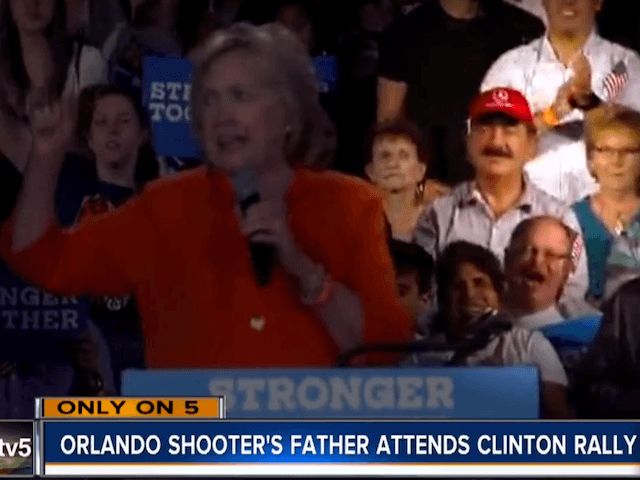 Seddique Mateen, the father of the Orlando shooter is an ardent Hillary Clinton supporter. No offence to Mario. You’d think that Mateen might consider the ramifications for Clinton before openly supporting her, but it seems he just can’t contain his enthusiasm. He was pictured standing directly behind her at a recent rally in Florida, and even created his own sign praising her policies. America’s gays should pay close attention to this story. Omar Mateen’s brutal slaughter of gays in Orlando was motivated by the virulent homophobia than runs through the Islamic religion. According to none other than his Hillary-supporting father, it was the sight of two men kissing on the street that pushed him over the edge — as if that was an excuse. And where did he learn the deadly Islamic intolerance of gays? From his father, of course. The same man who made a sign praising Hillary as “good for national security” is an ideological supporter of the Taliban who, shortly after the Orlando shootings, said that Muslims didn’t need to kill gays because “God will punish those involved in homosexuality.” In other words, at the Mateen household, punishing gays was only frowned upon because, well, that’s Allah’s job! For Democrat-supporting gays, it’s time to take stock of the situation. Hillary Clinton may not welcome Mateen’s support, but she hasn’t openly disavowed it either (contrast that with Trump’s rapid rejection of David Duke). But the bigger issue is, why is Mateen supporting her in the first place? Let me put it another way. A homophobic Muslim says he supports Hillary because she’ll take guns out of the hands of law-abiding citizens looking to defend themselves against people exactly like his son. A politics-obsessed Afghani who runs a TV show openly praising the Taliban praises Hillary for her stance on “national security.” It’s sort of like the local mobster endorsing a District Attorney candidate. Whoever he backs, it’s probably best to vote for the other guy. Gays need to take another look at the Democratic party. There’s a reason why Mateen supports Hillary, and it’s obvious: she’s far softer on Muslim radicals, both foreign and domestic, than Donald Trump. In an age where the greatest threat to gays bows down towards Mecca five times a day, this is deadly serious. Even without the Islam stuff, Trump had a better track record on supporting gay rights than Hillary Clinton. But the endorsement of Siddique Mateen raises the stakes far beyond petty squabbles over marriage and wedding cakes. For gays, the threat of Islam is a matter of life or death. There can be no second guesses, and there will be no second chances. This election year, we’re voting for our very survival. After the shootings, I visited Orlando to give a speech. I said then what I’ll say again now: gays, like Jews after the Holocaust, need to say “Never Again!” That means dumping the Democrats if their daily capitulations to Islam don’t come to a sudden stop — and it doesn’t look like they will. The party’s been nice to us in the past, sure. But they’ve chosen Muslims over us. We need to stop choosing them.